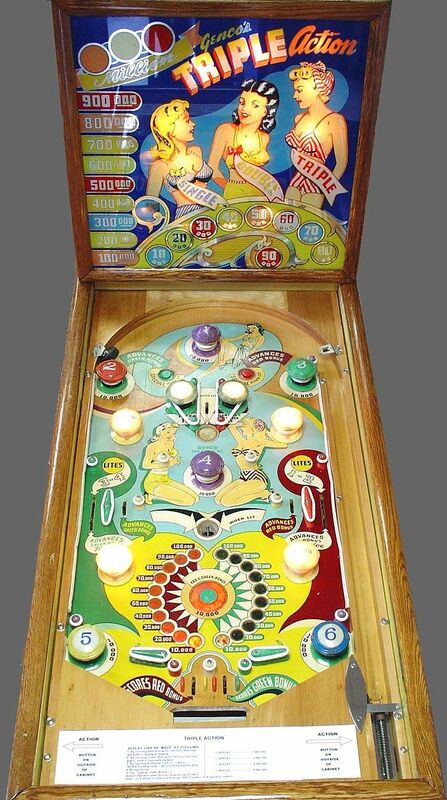 The origins of pinball are intertwined with the history of many other games. Games played outdoors by rolling balls or stones on a grass course, such as Bocce or Bowls , eventually evolved into games played by hitting the balls with sticks and propelling them at targets. Croquet and Shuffleboard are examples of these games. These games led to indoor versions that could be played on a table, such as Billiards or Carrom , or on the floor of a pub like Bowling . The tabletop versions of these games became the ancestor of the modern pinball machine. The existence of table-based games dates back to the 15th century. While some games took the wickets and balls of Croquet and turned them into the pockets of modern billiards, some tables became smaller and had the holes placed in strategic areas in the middle of the table. In France, during the reign of King Louis XIV, someone took a billiard table and narrowed it, placing pins at one end of the table while making the player shoot balls with a stick or cue from the other end. Pins took too long to reset when knocked down, so the pins eventually were fixed to the table and holes took the place of targets. Players could ricochet the ball off the pins to achieve the harder scoring holes. In 1777, a party was thrown in honor of the King and his wife at the Château de Bagatelle , owned by the brother of the king. The highlight of the party was a new table game featuring the slender table and cue sticks, which players used to shoot ivory balls up an inclined playfield. 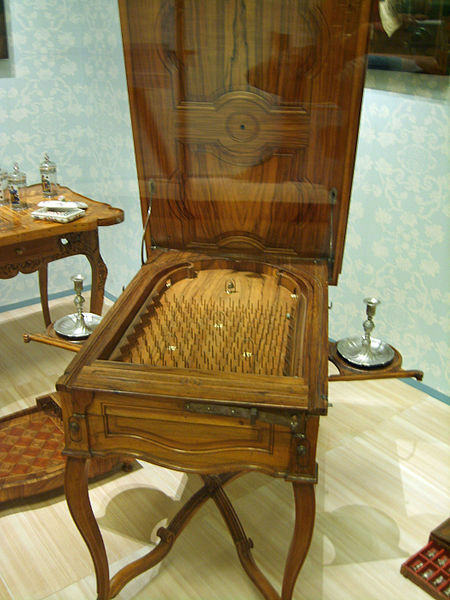 The table game was dubbed Bagatelle by the King's brother and shortly after swept through France. Some French soldiers carried their favorite bagatelle tables with them to America while helping to fight the British in the American Revolutionary War. Bagatelle spread and became so popular in America as well that a political cartoon from 1863 even depicts President Abraham Lincoln playing a tabletop bagatelle game. In 1869, a British inventor named Montague Redgrave settled in America and manufactured bagatelle tables out of his factory in Cincinnati, Ohio. In 1871 Redgrave was granted US Patent #115,357 for his "Improvements in Bagatelle", which replaced the cue at the player's end of the table with a coiled spring and a plunger. The player shot balls up the inclined playfield using this plunger, a device that remains in pinball to this day. This innovation made the game friendlier to players. The game also shrank in size and began to fit on top of a bar or counter. The balls became marbles and the wickets became small "pins". Redgrave's innovations in game design are acknowledged as the birth of pinball in its modern form. Pinball machines, like many other mechanical games, were sometimes used as gambling devices. 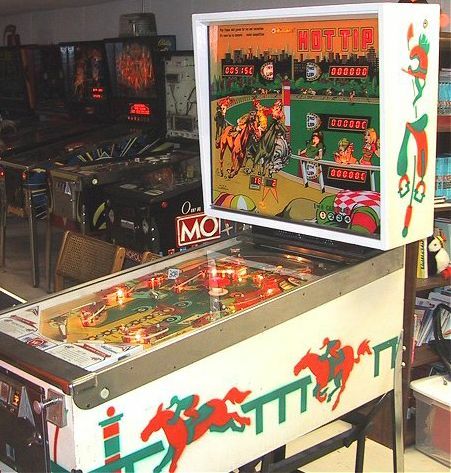 Some pinball machines, such as Bally's "bingos ", featured a grid on the backglass scoring area with spaces corresponding to targets or holes on the playfield. Free games could be won if the player was able to get the balls to land in a winning pattern, however, doing this was nearly random, and a common use for such machines was for gambling. Other machines allowed a player to win and accumulate large numbers of "free games" which could then be cashed-out for money with the location owner. Later, this type of feature was discontinued in an effort to legitimize the machines, and to avoid legal problems in areas where awarding free games was considered illegal, some games — called Add-A-Ball games — did away with the free game feature, instead giving players extra balls to play (between 5 and 25 in most cases). These extra balls were indicated via lighted graphics in the backglass or by a ball count wheel, but in some areas even that was disallowed and so some games came with a sticker to cover over the counters. One important and notable area where pinball games have been regulated or banned was in New York City, beginning in the 1940s and continuing until 1976. The ban ended when Roger Sharpe (a star witness for the Music and Amusement Association) testified in April 1976 before a committee in a Manhattan courtroom that pinball games had become games of skill and were no longer games of chance (i.e. gambling). He began to play one of two games set up in the courtroom, and — in a move he compares to Babe Ruth's home run in the 1932 World Series — called out precisely what he was going to shoot for, and then proceeded to do exactly so. Astonished committee members reportedly then voted to remove the ban, a result which was then followed in many other cities. Like New York, Los Angeles banned pinball machines in 1939. 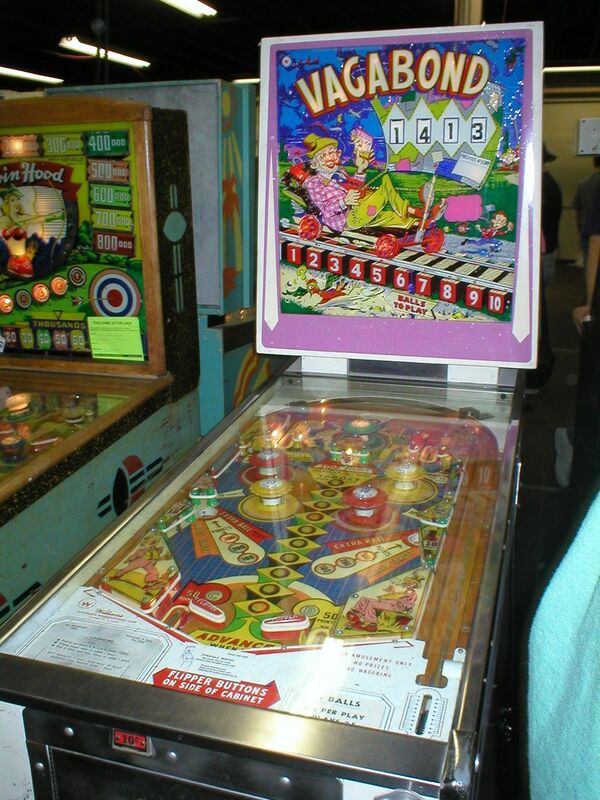 The ban was overturned by the Supreme Court of California in 1974 because (1) if pinball machines were games of chance, the ordinance was preempted by state law governing games of chance in general, and (2) if they were games of skill, the ordinance was unconstitutional as a denial of the equal protection of the laws. More recent games are clearly labeled "FOR AMUSEMENT ONLY" in an attempt to emphasize their legitimate, legal nature. Another close but distinct relative of pinball is Pachinko , a gambling game played in Japan. Although they share a common ancestry, the games are very different, in that pachinko simply involves shooting many small balls one after the other into a nearly-vertical playfield, while pinball is about the manipulation of the small number of balls currently in play. By the 1930s, manufacturers were producing coin-operated versions of bagatelles, now known as "marble games" or "pin games". The table was under glass and used Redgrave's plunger device to propel the ball into the upper playfield. 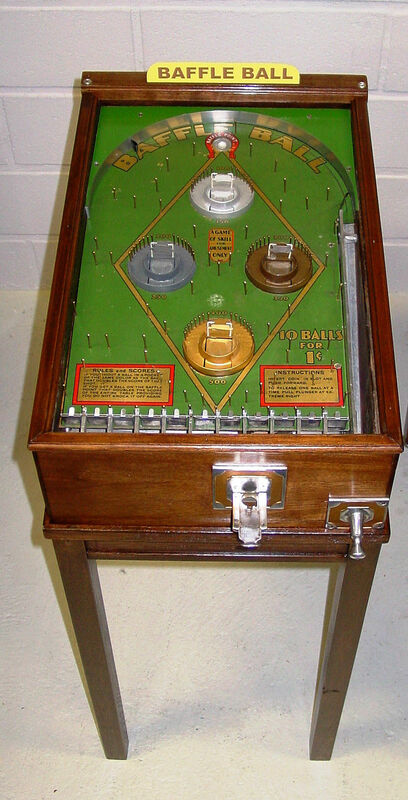 In 1931 David Gottlieb 's Baffle Ball became the first overnight hit of the coin-operated era. Selling for $17.50, the game dispensed five balls for a penny. The game struck a chord with a public eager for cheap entertainment in a depression-era economy. Most drugstores and taverns in America operated pinball machines, with many locations making back the cost of the game in a matter of days. 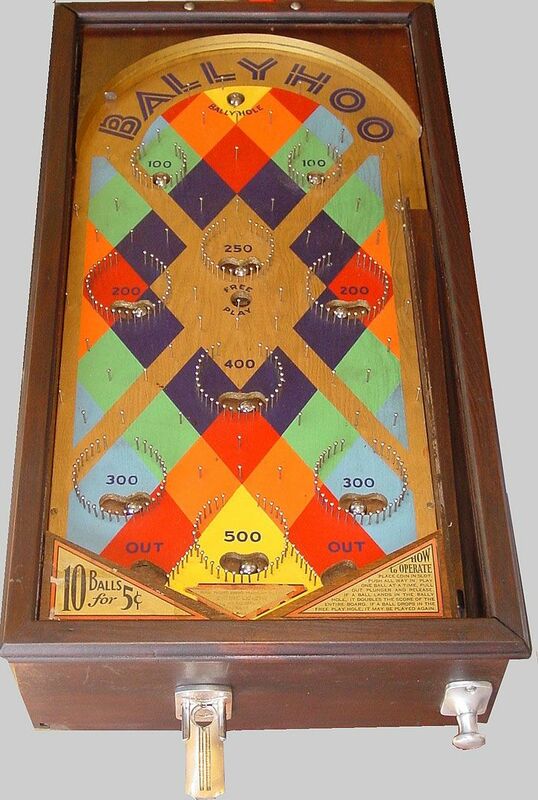 Baffle Ball sold over 50,000 units and established Gottlieb as the first major manufacturer of pinball machines. In 1932, Gottlieb distributor Ray Moloney found it hard to obtain more Baffle Ball units to sell. In his frustration he founded Lion Manufacturing to produce a game of his own design, Ballyhoo , named after a popular magazine of the day. The game became a smash hit as well, its larger playfield and ten pockets making it more of a challenge than Baffle Ball, selling 50,000 units in 7 months. Moloney eventually changed the name of his company to Bally to reflect the success of this game. These early machines were relatively small, mechanically simple and originally designed to sit on a counter or bar top. The 1930s saw a leap forward in innovation in pinball design and devices with the introduction of electrification. 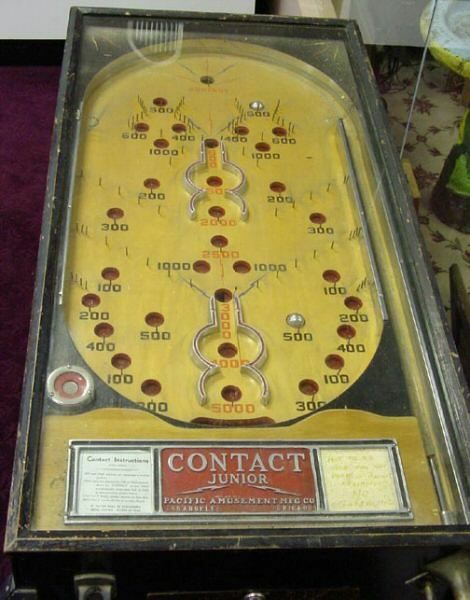 A company called Pacific Amusements in Los Angeles, California, USA produced a game called Contact in 1933. Contact had an electrically powered solenoid to propel the ball out of a bonus hole in the middle of the playfield. Another solenoid rang a bell to reward the player. The designer of Contact, Harry Williams , would eventually form his own company, Williams Manufacturing , in 1944. Other manufacturers quickly followed suit with similar features. In addition, electric lights soon became a standard feature of all subsequent pinball games, designed to attract people to the game. By the end of 1932 there were approximately 150 companies manufacturing pinball machines, most of them in the city of Chicago. Chicago has been the center of pinball manufacturing ever since. Competition between the companies was brutal, however, and by 1934 there were only 14 companies left. During World War II all of the major manufacturing companies in coin-operated games were put into use manufacturing equipment for the American war effort. Some companies like Williams bought old games from operators and refurbished them, adding new artwork with a patriotic theme. By the end of the war, a generation of Americans looked for amusement in their bars and malt shops. Pinball saw another golden age of growth. Innovations such as the tilt mechanism and free games (known as replays) appeared. The post-war era was dominated by Gottlieb . Game designer Wayne Neyens along with artist Leroy Parker turned out game after game that collectors consider some of the most classic pinball machines ever designed. The most famous were designed by James Rider, the man behind the epitomized catchphrase "I've got it", amongst others. Gottlieb's Humpty Dumpty , introduced in 1947, was the first game to add player-controlled flippers to keep the ball in play longer and added a skill factor to the game. 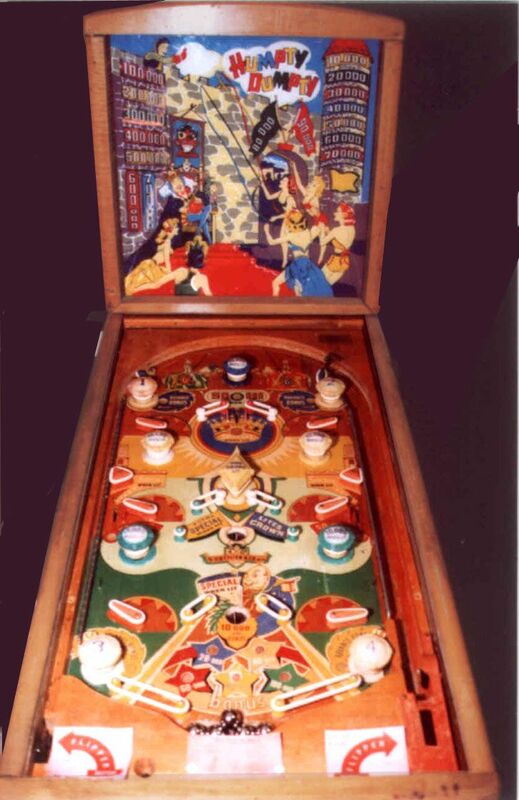 The low power of the Humpty Dumpty flippers necessitated that three pairs be placed around the playfield in order to get the ball to the top. 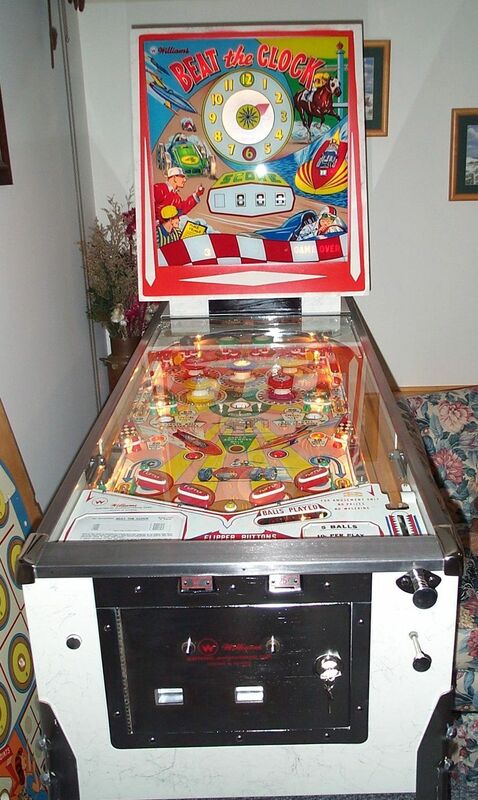 But the addition of a DC power supply enabled the flippers on Humpty Dumpty to become only two, more powerful ones at the bottom of the Triple Action playfield -- one of many innovations by designer Steve Kordek , who is also credited with introducing the very first "drop target" (1962 on Vagabond ) and "multiball" (1963 on Beat the Clock ) concepts to the game. The advent of the microprocessor brought another new age for pinball as it entered into the realm of electronic gaming. The electromechanical relays and scoring reels that drove games in the 1950s and 1960s were replaced in the 1970s with circuit boards and digital displays. 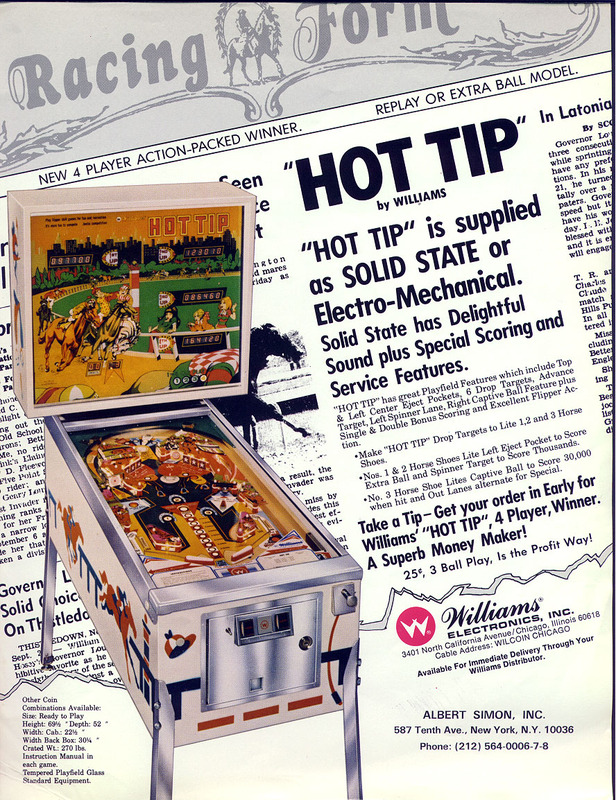 Williams introduced their first solid-state electronic game, Hot Tip , in 1977, and because of this new technology, they and Bally thrived in this era as they both sold large amounts of games with fancy sound effects, speech, and game features that only a computer could make possible. The video game boom of the 1980s, however, signaled the end of the boom for pinball. Arcades quickly replaced rows of pinball machines with games like Asteroids and Pac-Man, which earned incredible amounts of money compared to the pinballs of the day. Bally, Williams, and Gottlieb continued to quietly make pinballs while they also manufactured video games in much higher numbers. Many of the larger companies were acquired by corporations or merged with other companies. Chicago Coin was purchased by the Stern family who brought the company into the digital era as Stern Electronics , which closed its doors in the mid-1980s. 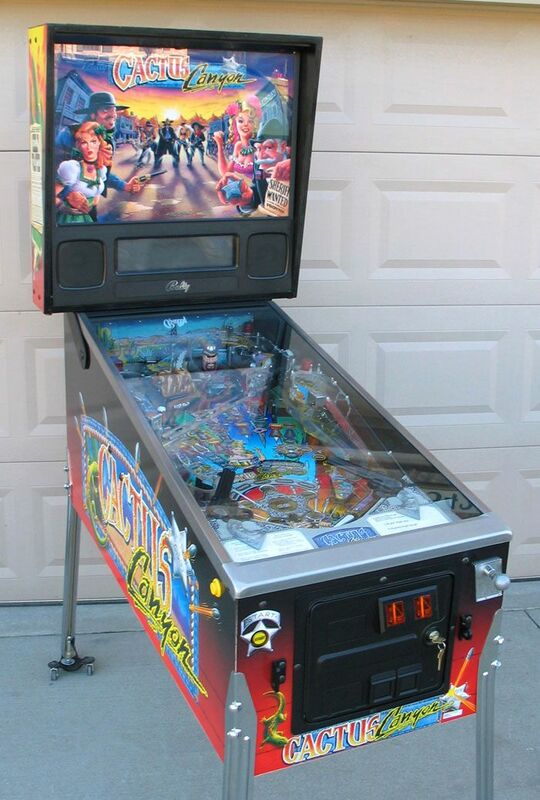 Bally exited the pinball business in 1988 and sold their assets to Williams, who subsequently used the Bally trademark on about half of their pinball releases from then on. After the collapse of the coin-operated video game industry, pinball saw another comeback in the 1990s. Some new manufacturers entered the field such as Capcom Pinball and Alvin G. and Company , founded by Alvin Gottlieb , son of David Gottlieb. Gary Stern, the son of Williams co-founder Sam Stern , founded Data East Pinball with funding from Data East Japan . The games from Williams now dominated the industry, with complicated mechanical devices and more elaborate display and sound systems attracting new players to the game. 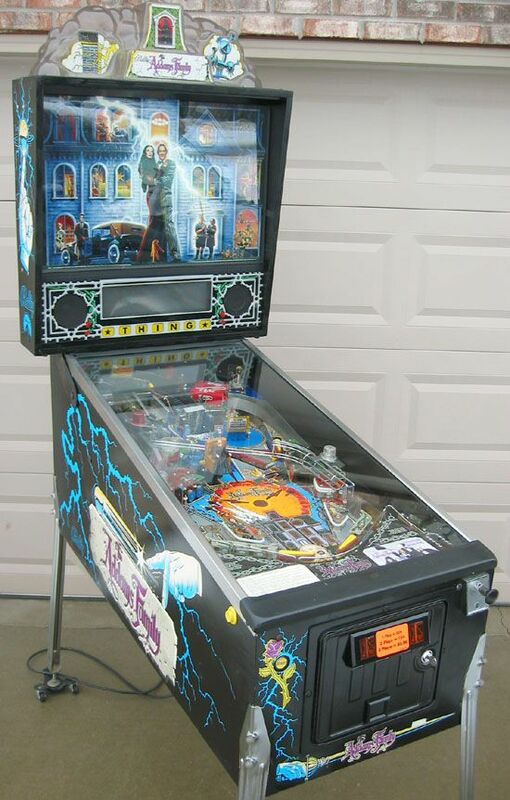 Licensing popular movies and icons of the day became a staple for pinball, with Bally/Williams' The Addams Family hitting an all-time modern sales record of 20,270 machines. 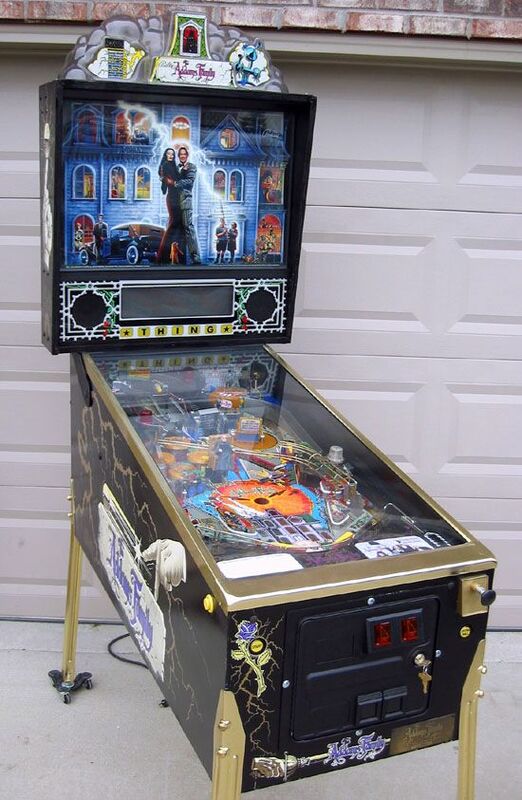 Two years later, Williams commemorated this benchmark with a limited edition of 1,000 Addams Family Gold pinball machines, featuring gold-colored trim and updated software with new game features. Other notable popular licenses included Indiana Jones: The Pinball Adventure and Star Trek: The Next Generation . Expanding markets in Europe and Asia helped fuel the boom. Pat Lawlor was a designer, working for Williams up until their closure in 1999. About a year after, Lawlor announced a return to the industry, starting his own company working in conjunction with Stern Pinball to produce new games into the new millennium. The end of the 1990s saw another downturn in the industry, with Gottlieb, Capcom, and Alvin G. all closing their doors by the end of 1996. Data East was acquired by Sega and became Sega Pinball for a few years. By 1997 there were only two companies left: Sega Pinball and Williams. In 1999 Sega sold their pinball division to Gary Stern (President of Sega Pinball at the time) who called his company Stern Pinball. By this time, Williams had shrunk its production runs significantly and reduced the manufacturing cost of their machines by incorporating fewer playfield toys than in earlier games. 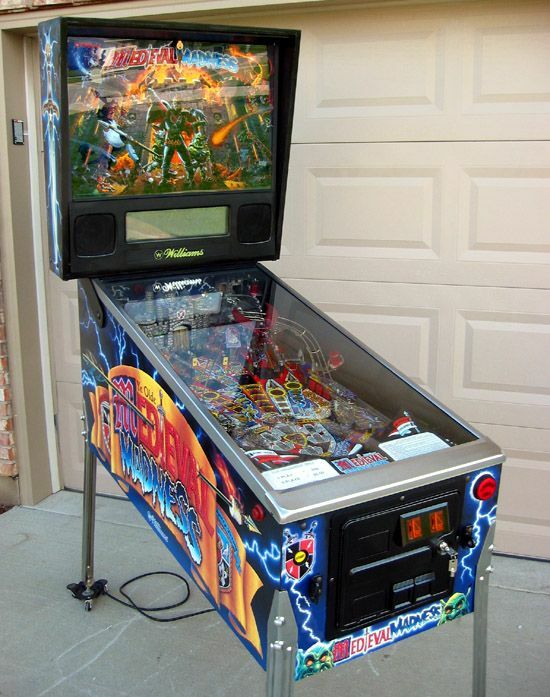 In 1999 Williams attempted to revive sales with the Pinball 2000 line of games, merging a video display into the pinball playfield. 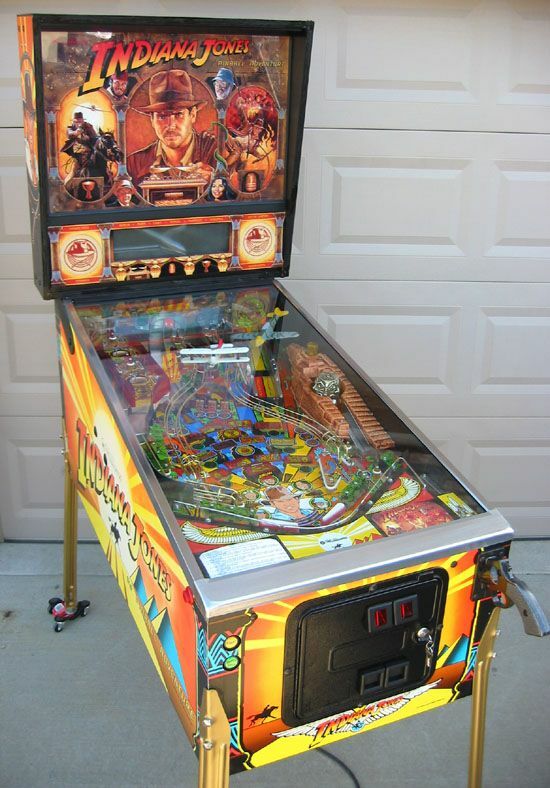 The reception was lukewarm and Williams exited the pinball business to focus on making gaming equipment for casinos, licensing the rights to Bally/Williams parts to Illinois Pinball and names to The Pinball Factory . 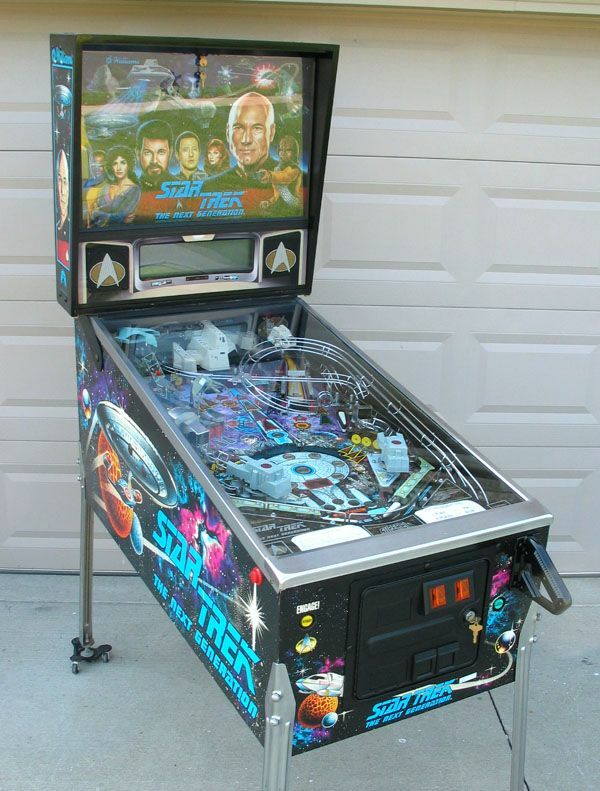 Stern Pinball is the only current manufacturer of original pinball machines. Almost all members of the design teams for Stern Pinball are former employees of Williams. 3. ^ Cossack v. City of Los Angeles, 11 Cal. 3d 726 (1974). I will be adding images to the article once I have them suitably hosted. If any one has any suggested additions, please post them below. Edited by Noah Fentz, 08 May 2012 - 11:40 PM. Here's an image of Redgrave's patent. I love that the name Bally came from the pinball table "Bally ball"
Edited by myklejay, 11 February 2009 - 08:47 PM. You've got the Power, You've got the Might, Get ready for battle..... Beat the Black Night! In 2006 TPF announced that they would be reproducing two popular 90's era Williams machines, Medieupload Madness and Cactus Canyon . In bolded pinball name there is mistake. It should be Medieval Madness. It´s quite nice to read the history of pinball, but I´m afraid you might´ve forgotten the Widebody trend of the late 1970s, which is home to some of the largest pinball tables made.